What was Napoleon’s attitude towards northern Italy at this time? The remark made by Napoleon in the autumn of 1801 is rich with inferences: “I go to Lyons. The Cisalpine people have asked me to prevent the debate and agitation which would surely result if they gave themselves a constitution. I thought it good to agree to this and to help in the formation of a state whose independence was bought with French blood”. (Recorded by Pierre-Louis Roederer in Oeuvres du comte P. L. Roederer / publiées par son fils le baron A.M. Roederer,… – Paris : Firmin Didot, 1853-1859, vol. 3, p. 428, hereafter Roederer, Oeuvres.) These three sentences reveal the broad lines of what remained Napoleon’s policy guidelines regarding Italy. First, Bonaparte did not trust the Italians to govern themselves; second, he very definitely wanted to have a say in the redaction of the constitution of the new republic; and third, Italy belonged to France and more specifically to Napoleon, since it was he alone who had conquered it. In the end, this threefold concern was to dissolve into a decision to become ‘King of Italy’ in the spring of 1805. This paper aims to consider how far this decision to become king was a long-term goal, how far Italian politicians wanted Napoleon to be king, and also how serious Napoleon was in offering the crown to his elder brother Joseph in the December of 1804. Marescalchi then went on to record Napoleon’s consideration regarding the complete annexation of Italy. “He [Napoleon] spoke in detail about the advantages, but came to no conclusion whatsoever as to whether these advantages would be sufficient to outweigh the loss of the hope of one day being a self-contained, independent Nation, the loss of their own magistrates, and the huge and painful efforts the government would have to make us accept complete amalgamation. He admitted that the example of Piedmont would certainly not be a reason for confidence in this respect. And finally he weighed up the obstacle of the lack of consent of the other Powers, already greatly afraid at such a colossal aggrandizement. He seemed to think that a complete independence ought to be more agreeable to us. However since we lacked everything required in this respect, he judged that if we wished to continue with the Republic, even with a modified constitution, we were not mature enough to be able to avoid falling into the traps which our enemies would ceaselessly lay for us or to avoid being exposed to all the evils of internal dissension which would have brought about not only our [Melzi’s and Marescalchi’s] ruin but also that of our institution. If we preferred a monarchical state or a mixed government, he could not imagine which prince could be chosen, and even if one could be found, France would then have to be in agreement. Marescalchi then went on to lay out his own opinions on the matter: “It must be the case that, despite the obstacles created by the different hypotheses, the First Consul favours one solution which can more easily be accommodated to the rest of the political edifice which he is erecting here and which will be complete in a few days time, without fear that it will be attacked or that it will fall down; a solution which, to put it frankly, must appeal more to him than to the others, and which at the same time could offer to us a way of getting what we have up to now desired in vain. I may be wrong, but I can almost see it. I certainly did not dare to suggest it to the Consul, but to you I can expound the problem such as it appears to me. […] We must set the premise that […] with an emperor in France, the idea of a Republic becomes for us a chimera and almost ridiculous. […] The best thing we can do is to take advantage of the situation so as to establish a constitutional monarchy or mixed government, where authority is suitably limited. Starting from this principle, I think that we should see this occasion as our best chance for emancipating ourselves and founding a government – the solution which at other times you thought best for us. Having said this, Bonaparte will probably deserve our eternal gratitude and we could not, without doing ourselves a disservice, refuse him. But, even if we were to imagine excessive generosity on his part such that he might renounce this right, I do not think that it would ever be prudent or advantageous to ourselves to provoke that generosity, or even to agree to it. As a result, I could not advise this request nor propose any other head than him, as long he deigned to be it. As for the title, it could be one or the other, it is of no importance, provided it was worthy of him. The interesting feature of Marescalchi’s note is that it shows Napoleon considering in detail the whole question: he had considered annexation but had ruled it out; that he was not a priori against Italian independence, but that time and support will be required; that he was concerned that the people be in agreement with the change of political system and constitution; that a ruler had to be found, even from within his family. The new emperor gives the impression of being the very model of moderation and liberality. There is also however a subtext to Napoleon’s remarks. The reference to annexation could be viewed as an indirect threat. The reference to Melzi’s position a vice-president could also be read as implying that Napoleon could depose him at will. We are also forced to conclude (despite Marescalchi’s impression that the Emperor did indeed have a plan) that Napoleon had not yet come to fixed conclusions. These Italian negotiations came not only right in the middle of the discussions in corridors and horse-trading over the proclamation of Empire in France, a declaration which would already have worried international opinion, but also at the climax of the Moreau-Cadoudal trial. Napoleon’s exhortations to the Italians that they should consult bought him time for reflection. In theory Napoleon was positive towards the initiative, but Marescalchi’s second point regarding the lessening of the burden of the military tribute was to prove a more than significant stumbling block. As part of his imperial progress, the emperor had meditated before the tomb of Charlemagne in Aachen, preparing for his own consecration and coronation as the new Charlemagne. He had also come to certain conclusions regarding the fate of Italy. On 11 July, Melzi had written to Napoleon asking him to lower the military tribute paid by the Italian republic. (Melzi, Carteggi, vol. VI, letter 2043, 11 July, 1804.) Napoleon was against and wrote a stinging missive to Melzi on 28 August intentionally taking Melzi’s demands that Italy pay a lower military tribute as a threat that the Italians might willingly return to Austrian hegemony. (Sent via Marescalchi, (Correspondance de Napoléon, letter no. 7968).) Melzi was (it is true) in frequent touch with the Austrian agent, Baron Moll – even using code words in their correspondence to refer to sensitive subjects such as Napoleon, Italy, Francis, etc – but the threat seems far-fetched. And so, in Mainz on 2 October, Napoleon summoned Marescalchi, gave him a fiery reception and demanded that the Italian Consulta come to Paris the following month. “What do these men from Milan want?” he thundered, “They should watch out! If they want to go back on their word they risk being transformed into French departments. They will be my outposts, they will suffer war and pay for it. Which prince do they have in Italy whom they could put at their head? It is of no interest to me to be king of Italy; it is they who must pronounce the will of the people. Have them send me a deputation of some individuals from the Electoral Colleges, the Courts, the Legislative Body, the Legislative Council and the Consulta di Stato. And Melzi had better be there! He must head the delegation and direct the deliberations so that everything goes according to the rules.” (Archivio Marescalchi, cart. 26.) The delegation duly arrived in Paris, not only to attend the coronation but also to negotiate the new constitution. After spending the whole month of December in Paris visiting the coronation celebrations without having received a summons, the delegation was finally called to a solemn audience on 30 December (in theory to grant them their leave from the coronation celebrations). Here Napoleon suddenly and aggressively addressed them in a long monologue. He informed the Italians that he himself was Italy’s salvation, that Italy could no longer remain a Republic or indeed become independent as such, and that she could certainly not become a constitutional monarchy under an Austrian prince. The choice was between “me or a prince from my family”. He then dismissed the Italian enjoining them to summon the Consulta, to use the voto already written as a basis for the new document, and to return the new constitution in eight days. (Notes by Valdrighi, quoted in Pingaud, Bonaparte, p. 431-433.) Since, as Thierry Lentz has pointed out, Napoleon was clearly aware that to take the crown of Italy himself would be a casus belli for Austria, the French emperor turned to the old plan (considered by the Italians back in May 1804), of handing the throne to his elder brother Joseph. Suggestions by Talleyrand encouraged him in the same direction. It was hoped that the ‘gentle’ Bonaparte, the diplomat of Lunéville, would not ruffle Austrian feathers quite so much. In November 1804, Napoleon was in full (private) discussions regarding the hereditary nature of the Empire and his desire to have Josephine crowned Empress. Roederer gives a remarkable account of the stinging interview which he [Roederer] had with Napoleon (dated 4 November, 1804) where the Emperor upbraided him for having placed Joseph too high in status in the establishment of the imperial heredity (should Napoleon die). Napoleon is supposed to have remarked: “What does Joseph want? He is putting himself in opposition to me, he is acting as a rallying point for my enemies. […] Joseph dares to tell that this coronation [of Joséphine] is contrary to his interests. […] this is to hit me where it hurts. They [the rest of the Bonaparte clan, ed.] say that I wish to give Italy to Eugène. Good god, I’m not mad! I think I am quite capable of governing Italy; and the state of Venice too. Italy brings me twenty million. If I gave her away, they would make a thousand little schemes so as to only give me fifteen.” (Roederer, Oeuvres, vol. 3, p. 515.) The important feature here is that the context is familial. In Napoleon’s opinion, given the impending coronation of Josephine (and thus the elevation of her children), Joseph is concerned that Louis’s children (descended from an Empress) would rank higher than his. (Roederer shows how, for Napoleon, this difference of opinion with his previously much loved brother (but of whom he was also very jealous) was decisive, (Roederer, Oeuvres, p. 517): “At another moment, after having said that his brother Joseph was trying to oppose him, he [Napoleon] said: ‘A month ago I wanted him [Joseph] to live at the Luxembourg palace. Today, I no longer want that’.) This is particularly interesting with respect to Napoleon’s offer of the Italian crown to Joseph shortly after this interview with Roederer. As Melzi perspicaciously noted (in code) to the Austrian agent Baron Moll on 11 December, 1804: “there is no doubt that if Fumagalli [i.e., Napoleon, ed.] is reduced to conceding preference on this contract to Pietro [i.e., giving the crown of Italy to Joseph, ed.] in light of the events of these days, he will be reduced to cutting off all relations with him.” (Melzi, Carteggi, vol. VII, letter 2341, p. 164.) [Via the Paris police, Napoleon was very probably aware that Melzi had been communicating with the Austrians during his time in Paris.] In the context of the previous interview, it would appear that Napoleon’s offer of the Italian crown to Joseph had a double purpose (and advantage): of distancing his brother and of offering a sop to Austria. Initially Joseph accepted, with an indemnity of 200,000 francs. And Napoleon wrote encouragingly to Francis on New Year’s Day 1805 claiming that he had handed the throne of Italy to Joseph thereby obviated his rights to it. On Joseph’s refusal, Napoleon turned to Louis and his offspring. A document was elaborated whereby Napoleon would take the crown as protector until the majority of Louis’s son, who would reign in Milan as Napoleon II. (Document quoted in Pingaud, Bonaparte, p. 437-8.) Louis was so aggressively against the plan Napoleon is said to have thrown him out of his office. (See Frédéric Masson, Napoléon et sa famille, vol. III, p. 20, quoted in Pingaud, Bonaparte, p. 438, n. 1.) The negotiation had lasted merely three days (27-30 January, 1805). So faced with potential embarrassment on a European scale, Napoleon cut the Gordian knot and decided to take the crown himself. He called a ‘conseil extraordinaire de cabinet’ for 5 February, where he announced to the nineteen people present (amongst whom, Melzi and five Italian deputies, Joseph, Cambacarer, Champagny, Fouché, Murat and Sieyès) that he would take the crown. The fate of Italy had been decided. We are left to conclude that Napoleon was entirely serious when he proposed Joseph, following Italian wishes (after all, Marescalchi was one of Joseph’s ‘party’), as king of Italy. This not only would have deflected Austrian ire but removed Joseph from Paris (and the imperial succession). Joseph refused not only because accepting the Italian crown would not only cut out of the imperial succession but also because he would be left with no room to manoeuvre his new kingdom. But Napoleon had suspected that Joseph would refuse the humiliating conditions. So he had three fall back positions, Louis, Eugène or himself. But as we have seen in the interview with Roederer, Napoleon did not want to give Eugène that crown. He was never particularly convinced by the Louis solution (as Napoleon noted to Marescalchi in the summer of 1804). Paul Schroeder is however wrong to describe the offer to Joseph as a ‘little comedy’. (Paul W. Schroeder, The transformation of European politics 1763-1848, Oxford (UK): Clarendon Press, 2003, p. 266.) The proposal was entirely serious, but it was merely one of many possible solutions. And perhaps in the end, the ultimate solution was the best. For regardless of Austrian displeasure, it had the advantage of re-affirming on the European stage Napoleon’s identity as the new Charlemagne. * In this article, the terms 'Italian/s' refers to the inhabitants of this first Italian Republic and subsequently Kingdom. (1) Alain Pillepich, Napoléon et les Italiens, Nouveau Monde Editions, 2003, p. 54. (2) “Iddio me la diede, guai a chi la toccherà”, (“God gave it to me, woe to him who touches it”) were the words spoken by Charlemagne when he received the crown as king of the Lombards in 774. They became the ritual words spoken by all those who received the ‘Iron Crown of the Lombards'. (3) Recorded by Pierre-Louis Roederer in Oeuvres du comte P. L. Roederer / publiées par son fils le baron A.M. Roederer,... - Paris : Firmin Didot, 1853-1859, vol. 3, p. 428, hereafter Roederer, Oeuvres. (4) I carteggi di Francesco Melzi d'Eril, Duca di Lodi, La vice-presidenza della Repubblica, vol. VI, Milan 1962, hereafter Melzi, Carteggi. (5) On 30 April, 1804, in the Tribunat, Curée had proposed the famous motion that Napoleon should become ‘Emperor of the French', see La proclamation de l'Empire, Paris: Nouveau Monde Editions, 2001, p. 24-29, and also on the website napoleonica.org http://www.napoleonica.org/proclamation/pro007.html. (6) Melzi, Carteggi, vol. VI, letter 1900, p. 158. (7) Melzi, Carteggi, vol. VI, letter 1925, p. 178-7. (8) Melzi, Carteggi, vol. VI, letter 1926, pp. 178-180. (9) In another private letter to Melzi on the same day, Marescalchi returns to the possibility of a member of the Bonaparte family acceding to the Italian throne. Lucien is rejected because of bad blood caused by his marriage to Alexandrine Bleschamp. “In my opinion – [Marescalchi's, ed. ], setting Joseph to one side – he would refuse it out of hand.” Marescalchi was well acquainted with Joseph, acted as his literary advisor and was very much of the elder brother's ‘party'. The Italian politician went on: “I think that the most suitable would be Louis, because he is a really good man, without pretensions and not lacking in judgement and character as is thought. It is his son whom the Consul wishes to appoint as his successor, despite the fact that he is only 18 months old. But – for heaven's sake, and between us – Louis is against it out of respect to his brothers. […] You see more clearly than I do. To dig in our heels about remaining a republic would now be madness. That he should leave us in total liberty would be worse. But he would never do that. So the best solution sees to me to seize the moment and get the best we can for ourselves.” Melzi, Carteggi, vol. VI, p. 182. (10) As Thierry Lentz has noted (Nouvelle Histoire du Premier Empire, Paris: Editions Fayard, vol. 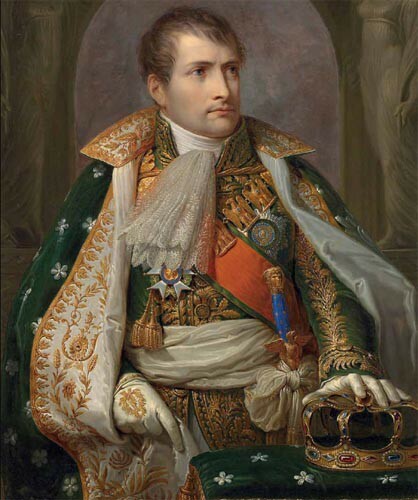 1, p. 117) inviting Napoleon to be king was not paradoxical, since it would cut political links with Austria and would also allow the Italians to impose conditions. (11) The full list of articles is printed in J.-E. Driault, Napoléon en Italie, Paris: Félix Alcan, 1906, p. 296-99. (12) Correspondance de Napoléon, letter no. 7814. (13) Melzi, Carteggi, vol. VI, letter 2038, p. 312. (14) Quoted in Albert Pingaud, Bonaparte président de la République italienne, Paris: Perrin, 1914, p. 413, n. 2, hereafter Pingaud, Bonaparte. (15) Melzi, Carteggi, vol. VI, letter 2043, 11 July, 1804. (16) Sent via Marescalchi, (Correspondance de Napoléon, letter no. 7968). (17) Archivio Marescalchi, cart. 26. (18) Notes by Valdrighi, quoted in Pingaud, Bonaparte, p. 431-433. (19) Roederer, Oeuvres, vol. 3, p. 515. (20) Roederer shows how, for Napoleon, this difference of opinion with his previously much loved brother (but of whom he was also very jealous) was decisive, (Roederer, Oeuvres, p. 517): “At another moment, after having said that his brother Joseph was trying to oppose him, he [Napoleon] said: ‘A month ago I wanted him [Joseph] to live at the Luxembourg palace. Today, I no longer want that'. (21) Melzi, Carteggi, vol. VII, letter 2341, p. 164. (22) Letter of 11 Nivôse, An XIII (1 January, 1805) Correspondence de Napoléon, letter no. 8250, quoted in Thierry Lentz, Nouvelle Histoire du Premier Empire, vol. 1, p. 119 and note. Napoleon sent similar letters to the kings of England, Spain and Naples, but omitted mention of the ‘Joseph solution'. (23) Melzi, Carteggi, n. 1, p. 228-230. Lucien made a speech in Milan in January (reported by Moll and published in Pedrotti, vol. I, p. 213 and cited in Melzi, Carteggi, p. 230, saying: he would not accept the crown of Italy “if the little beggar (piccolo bougre) doesn't give him complete independence”. See also Joseph Bonaparte, Mémoires et correspondance politique et militaire du roi Joseph / publiés, annotés et mis en ordre par A. du Casse. - 2e ed. vols I to IX. Paris: Perrotin, 1854-1855, vol. 1, p. 92, where Joseph refers to the heavy tribute which he would have had to pay. (24) Document quoted in Pingaud, Bonaparte, p. 437-8. (25) See Frédéric Masson, Napoléon et sa famille, vol. III, p. 20, quoted in Pingaud, Bonaparte, p. 438, n. 1. (26) Paul W. Schroeder, The transformation of European politics 1763-1848, Oxford (UK): Clarendon Press, 2003, p. 266.